AMONG THE MULTITUDES of disciples of Guru Padmasambhava during the time that he visited Tibet, twenty-five were exceptional in that they equalled Padmasambhava's realization. 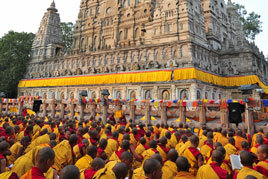 One of these disciples was the Great Lopon Vairotsana, a deeply realized being, a scholar and translator. 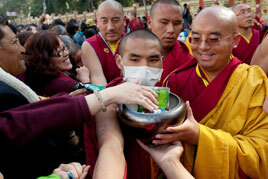 When Vairotsana passed away, he was among the first of the practitioners in Tibet to enter into the rainbow body. This accomplishment is in itself a great mark of realization. Jamgon Kongtrul the Great is an emanation of Lopon Vairotsana. As a matter of fact, his emanations go back in the past as far as Shakyamuni Buddha. But the emanation referred to here was among the first Tibetan incarnations and because of his vows and practice in Tibet, he incarnated there from that time on. All of his incarnations were great scholars and realized beings, always actively involved in important sequences of the Dharma in Tibet. 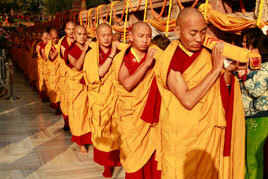 He will be a Bodhisattva of ineffaceable qualities. As prophesied by the Buddha, Jamgon Kongtrul the Great was born in Upper Eastern Tibet, to the east of Lhasa, in a place called Kongpo. That is how he got his name: Kong as in Kongpo and trul from trulku or the Tulku of Kongpo. When Jamgon Kongtrul the Great was born, he manifested many miracles which indicated that he was the reincarnation of an enlightened being. As a young child he proved beyond doubt to be learned and realized. At that time in Kongpo the Bon tradition, an indigenous religion of Tibet, was quite prevalent and the Bon people, nevertheless, recognized and upheld him as their supreme spiritual guide. The Bon followers offered him the name of Teny Yungdrung Lingpa (which means "second to none," as Padmasambhava was called. 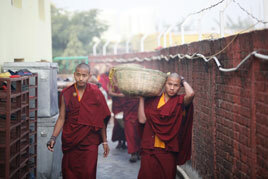 He was as realized as the Buddha; they had not previously experienced one so realized). 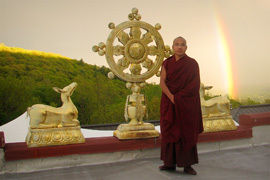 In the earlier part of his life he appeared as this Bon teacher, yet inwardly he manifested as a great Vajrayana Master. 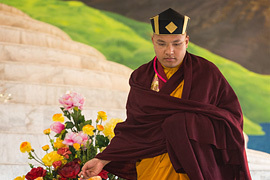 Thus, he imparted the profound Vajrayana teachings to the Bon followers in the most skillful ways and for the first time among the Bon followers a number of practitioners entered the rainbow body. 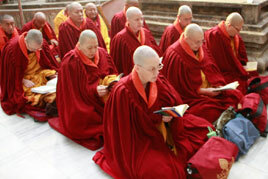 Later on he travelled all over Tibet receiving teachings and transmissions from over one hundred of the most learned and realized masters of the four major schools of Tibetan Buddhism: Kagyu, Gelug, Sakya, and Nyingma. He performed all these activities as a simple monk carrying his basic needs on his back and seeking alms whenever food was needed. He never revealed himself as a greatly learned and awakened being. Sheja Dzo of 3 volumes. In these Five Great Treasures he has provided very clear and complete commentaries. 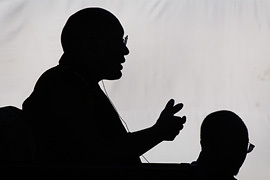 He also went through the painstaking task of making sure that all these teachings maintained an unbroken line of empowerment, instructions and other forms required in a continuous line of transmissions. Because of the great responsibility he had assumed toward the preservation and spread of the Great Teachings, he was recognized by all the schools of Buddhism in Tibet as one of the greatest Rime (non-sectarian) masters. 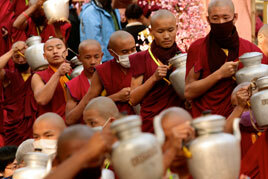 Among all his renowned teachers, his personal root guru was Situ Pema Nginje Wangpo, the 9th Situpa. 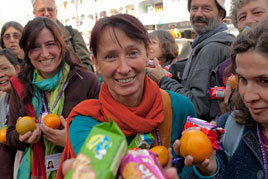 Because of this, Jamgon Kongtrul the Great is among the golden chain of Kagyu Lineage masters. 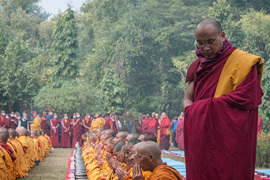 Not only did he preserve the essence of Buddhadharma through the Five Great Treasures, but during his lifetime he personally helped to sustain these unbroken lineages by giving empowerments and oral transmissions to numerous practitioners of the Dharma. 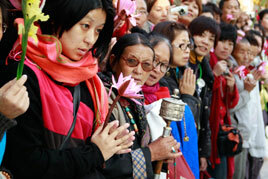 When Communists invaded Tibet in 1950s, the existence of Buddhism was destroyed really. 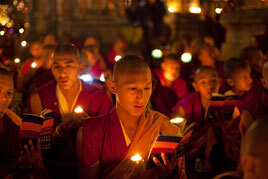 Yet mainly due to the work of Jamgon Kongtrul the Great, the unbroken line of Dharma teachings has been preserved; without him the teachings might have degenerated, possibly even if Communism had not taken over Tibet. 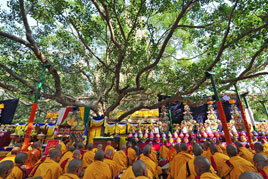 In short, the presence and activity of Jamgon Kongtrul the Great was most timely and in accordance with the predictions of the Buddha that when there will be degeneration of the Dharma, a great Bodhisattva will uphold it by preserving the teachings in writing and by transmitting the Dharma through an unbroken lineage. Jamgon Kongtrul the Great (Lodro Thaye) lived well into his eighties and before passing away he prophesied that he would have five incarnations of Body, Speech, Mind, Qualities and Activities. He also prophesied that his mind incarnation would make his main seat the great retreat caves Tsen near Palpung, the seat of the Situpas. 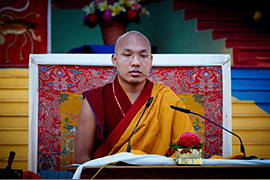 In accordance with such predictions, the second Jamgon Kongtrul, Khentse Oser, was born as a prince son of the Fifteenth Karmapa, Khakhyab Dorje, and established his seat at Tsen. 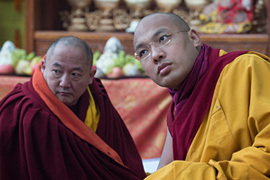 During his lifetime he maintained an immensely important role in the preservation of the Kagyu Lineage and became teacher to His Holiness the Sixteenth Gyalwa Karmapa. Thus again, he was among the golden chain of the Kagyu Lineage. 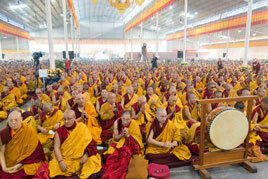 At the end of his life, Khyentse Oser alerted his close disciples that soon he would be passing away. When his disciples made an ernest request that he live longer, he told them that it was time for him to go, but they should not mourn or worry because his emanation would be born soon. He prophesied that the birth would be in a family related to his mother and in fact, the house where he would be born could be seen from the house of his present mother. 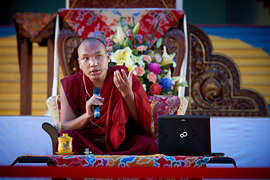 When his disciples requested more information, he convinced them that there was no need as the all-knowing wisdom mind of the Karmapa will see whatever other information was necessary. He also said that the Third Jamgön Kongtrül would, in fact, play a more important and expansive role in the spread and preservation of the Buddhadharma. So in 1954, precisely in accordance with the predictions of the Second Jamgon Kongtrul, the Third Jamgon Kongtrul was born into a noble family from a dakini mother with noble qualities. 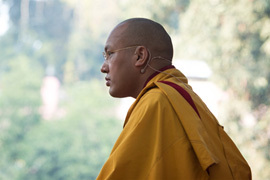 From the time he was a little child, he was brought up under the special care of His Holiness the Sixteenth Gyalwa Karmapa. 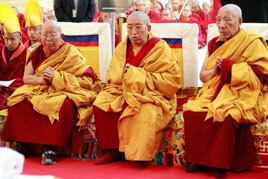 He received full transmission and education from both His Holiness and other eminent masters of the Kagyu Lineage. 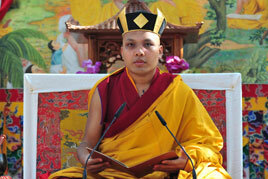 In 1984, His Eminence Jamgon Kongtrul Rinpoche was one of the four regents of His Holiness Karmapa. He was fully matured and manifested the wisdom, compassion and presence of the Kongtrul Lineage as well as that of His Holiness Karmapa. 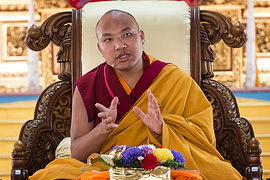 He paid close attention to the many important wishes of His Holiness the Sixteenth Karmapa and diligently fulfilled them with tremendous confidence and enthusiasm. 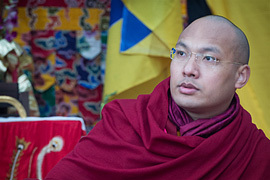 For those who had the good fortune to experience his presence and teachings during his short visit to the United States in 1984, it was abundantly clear that His Eminence was an awakened heartfelt son of His Holiness Karmapa, and that he was completely trustworthy.